We decided to hear a couple tunes from some of our favorite artists who were playing at a local town’s monthly First Friday event. It’s a big night for the town with loads of people shopping the downtown and catching some music by local musicians. To really fit into the shopping scene, I stopped by one of the thrifts. I am resourceful that way and so is the thrift (The Resourceful Woman). 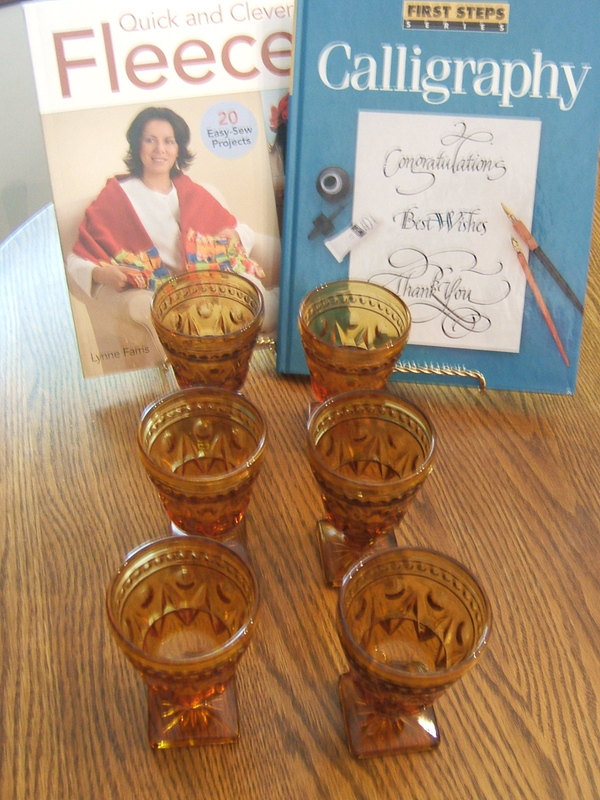 I couldn’t believe it when I found these amber Colony glass “Park Lane” wine glasses. I had just found their green counterparts the week before. They were a little over my normal price range, but when shopping at a charity thrift, I will sometimes bend my own rules. I bought six of these for $1.25 each. I also picked up two books for possible resale. Saturday was a continuation of the most gorgeous weather we have seen in a while. After taking our Scotties for a vet visit, we all headed out for some yard sales. On our way to a local church sale, we made a detour at a yard sale where the theme of my purchases was dogs. I found some dog bowls, a rubber mat on which to place the dog bowls, and two sweet pink pillowcases embroidered with, what else, dogs. The church sale was our next stop. Even though we were a little late to the party, they still had some fun things. I also ran into my friend “S” shopping this sale. She gave me a heads up about another sale across town. 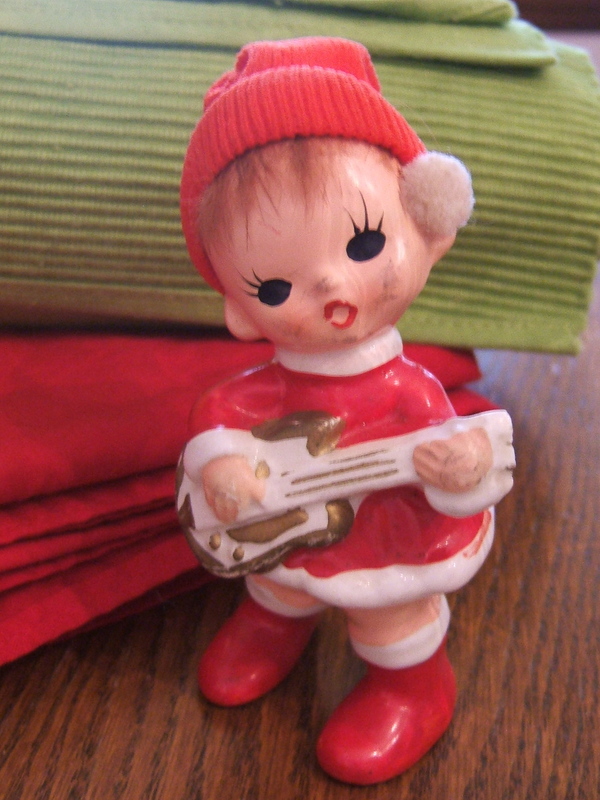 At the church I found some lime green placemats, what I thought were red napkins but are more like large table scarves, some books I hope look like nothing but turn out to be great for resale and a sweet little vintage Christmas elf playing a guitar. She needs a little clean up as she’s gotten a little mussed up over the years. The next stop at the same neighborhood sale produced a beautiful footed silver-plate tray. 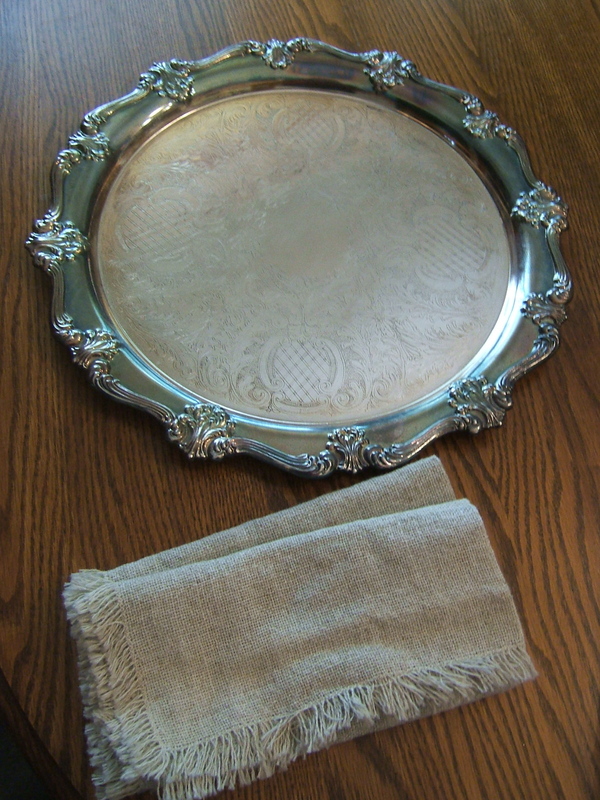 My thrifted silver-plate tea set will look just perfect on this tray. I also picked up four books (several by Phillipa Gregory – has anyone read her historical fiction?) and three dvds here. Not bad for $10! We then headed to the other side of town for yet another community yard sale. It was such a beautiful day and there were sales everywhere. I found another silver tray and some napkins at one sale. Dare I tell you that I paid only $1.50 for these? 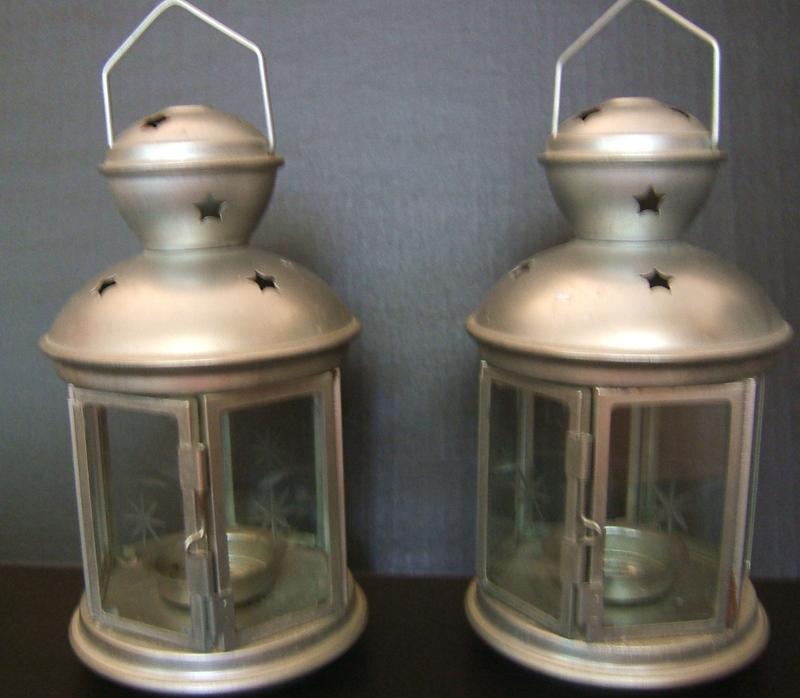 Another sale yielded these lanterns for $1 each. He is my driver but does not actually shop so it was up to me to bargain for this Grumbacher moveable model. Turns out there was no bargaining necessary. Yes, I will gladly pay $1. 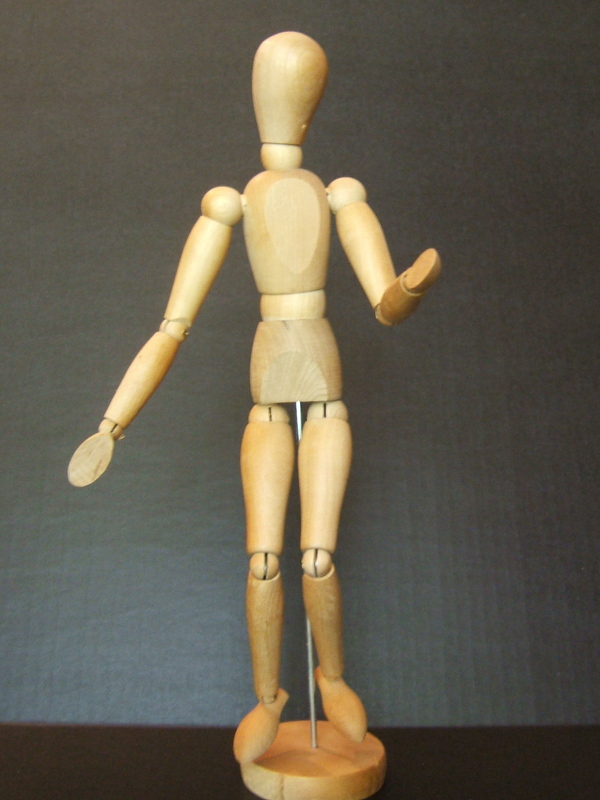 With a little wood glue to permanently a-fix his right leg he (or she) will be good as new. We were pretty tired after this big morning but we still had one more stop to make. A thrift shop, called Twice is Nice was having a sale. A friend (thanks Amy) had sent me a message via Facebook to let me know that there were some items she thought I might be interested in. The two Scottie figurines she alerted me to really did remind me of our two Scotties after this full morning of yard sales. 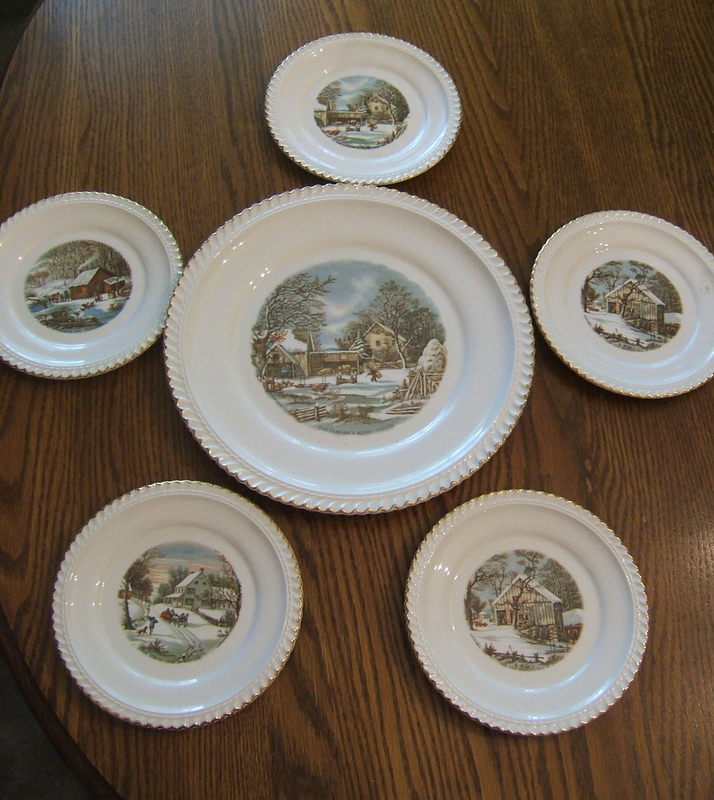 But the big “find” was this Currier and Ives cake set by Harkerware. There were five dessert plates and the large cake plate, each with a different winter scene. Don’t cry when I tell you that I got these beautiful plates on a 75% discount for a grand total of ……. $3. I was so happy Amy had steered me to this shop. It will take some special yard sales next week to top this week’s wonderful finds. I think we are up for the challenge. Be sure to come back next week to see how we did. This entry was posted in Dishes, Garage Sales, Silver, Tablescaping, Thrifting, Uncategorized, Vintage, Yard Sales. Bookmark the permalink. Wow and double WOW!! You really found some deals today. 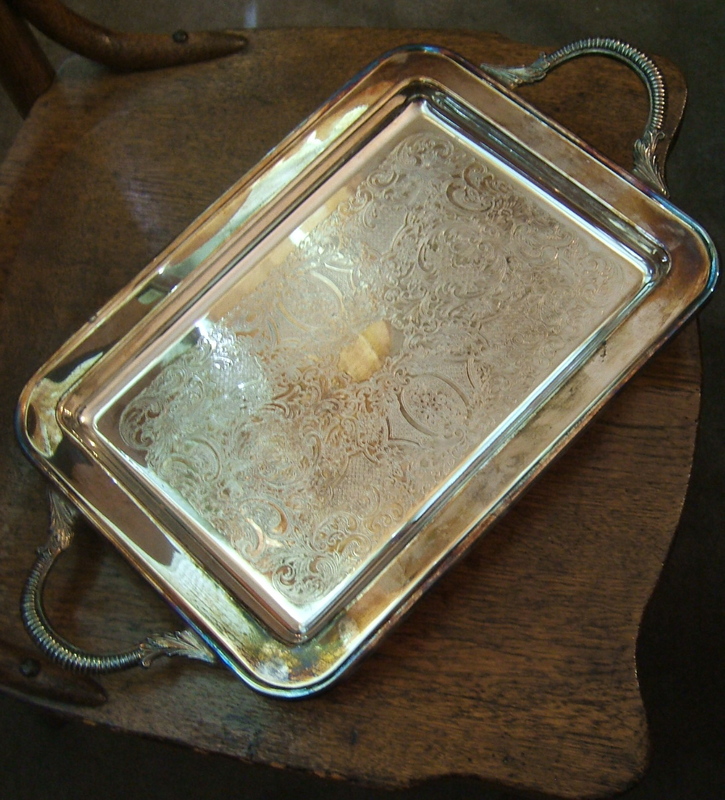 I love the silver tray with handles. wow you found some fantastic treasures. 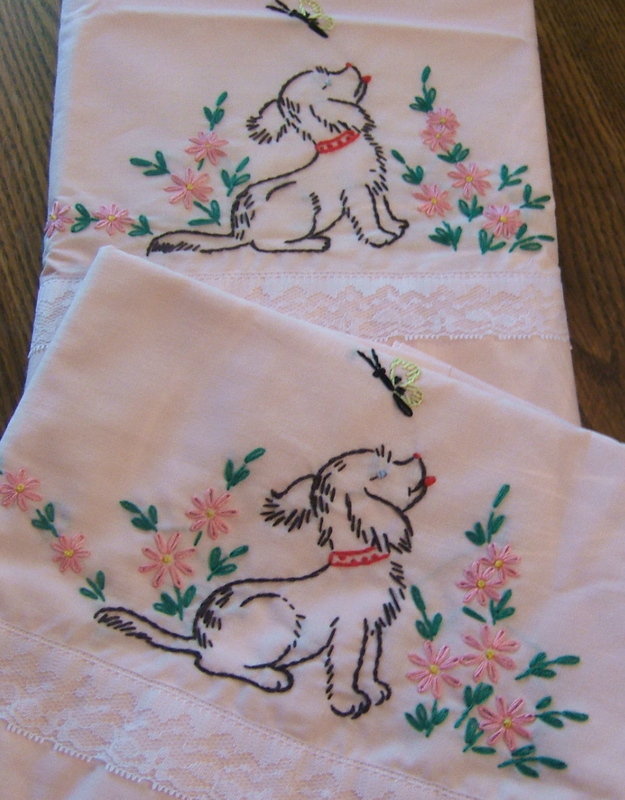 I love the doggie hand towels.. so cute! i really love those dog pillowcases! Great finds! I bought those amber glasses at Savers a few months ago. Good for Fall scapes! Never knew the name of them though! Those cake tins are great, so expensive in the shops,I have found one of those myself. Love the silver trays as well. It’s Paulette from the Cheerful Thrifty Door. Thanks for visiting my blog and leaving a comment. My blog is just three weeks old and I get very excited to get comments and have followers. 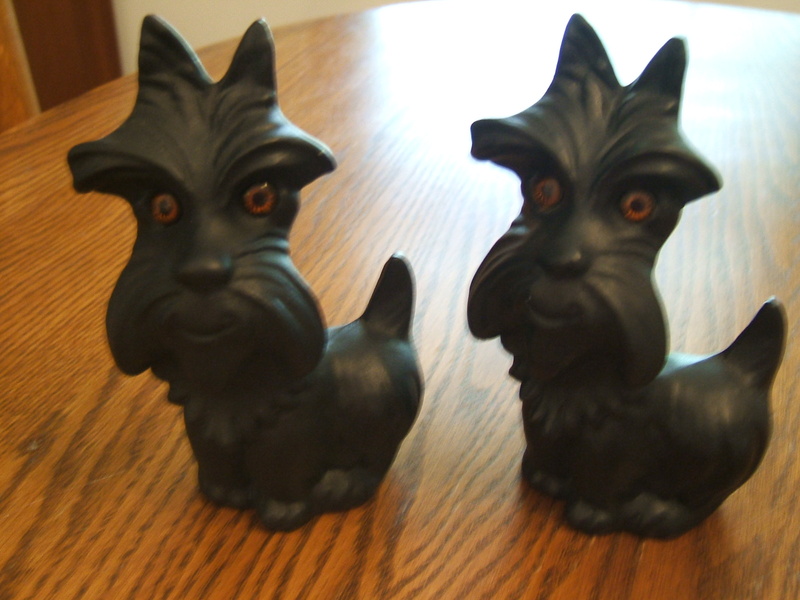 Since you have Scottie dogs I would like to gift you the two Scottie dog planters. Email me your address. Aww, Paulette, you are too sweet! All your finds are great, but I love the little dog pillowcases and the silver platters! I never find so many great things while thrifting, so I think I need to go shopping with you. Especially since we’ll have taxi service! I love the amber glasses- I have some wines and some dessert cups in this color. I wish I could find the green, like you did. Those embroidered pillow cases are adorable. My favorite of your finds was the hinged model. What a fun addition to a vignette this would make! OH my Word! Great findings! 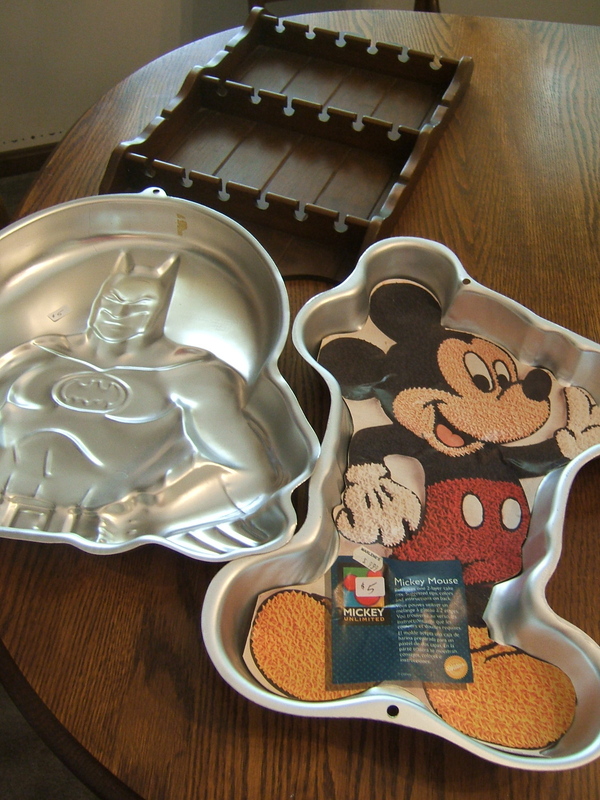 Funny – I found half a dozen cake pans at thrift this week. Now to scrounge up big enough shipping boxes so I can resell them! Oh – and my Tupperware measuring spoons? Yes, I love them, too. They hold memories from the past with my Mum repping for Tupperware in the UK and the US. We always had plenty of plastic goodies about. Awesome finds Tammy! You really got some great items! I love the plate set. I have a set of the dinner plates of the same pattern and love them. Thank you in advance for joining TTF. I should have the post up soon. Have a great day! Wow! Amazing finds! Love the cake set! And the moveable model was a steal! Thanks for sharing. 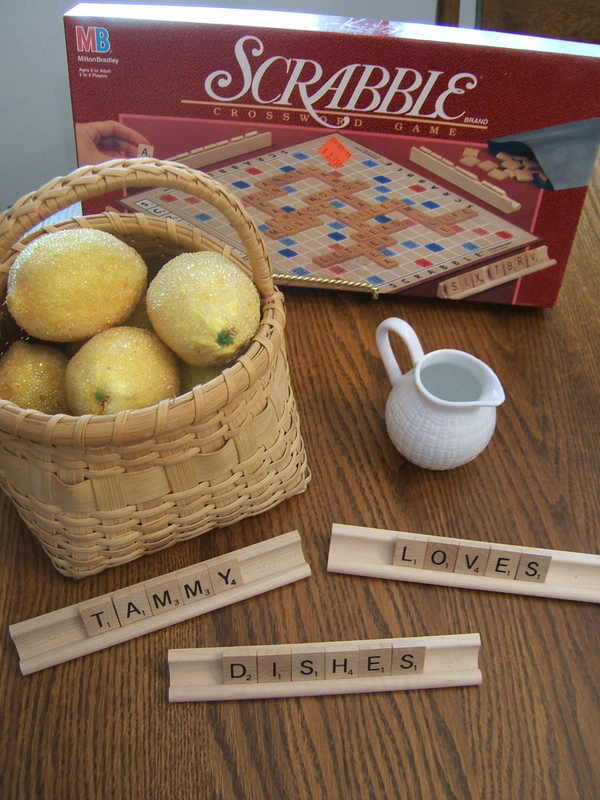 I loved the idea of using the crossword puzzle to write words and decorate the tables. I loved the shape of Mickey … wow! Invite for a visit on my blog and I hope you enjoy. You are good with your Amazinf finds sweet lady !!! I also love your Dishes and your Amber Glasses sweet. Thanks so much for your lovely comments on my new Tablescapes. Thanks for stopping by. Yes, your name does say you love dishes. I do too! I really don’t know why I am drawn to them…but I am….